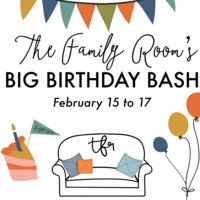 Join us as we celebrate our first birthday at The Family Room! All weekend long we wil be celebrating our first birthday with sales, a $25 gift certificate giveaway, and our special hidden coupons! We will be offering double punches on our coffee loyaltty card and introducing a NEW ice cream loyalty card with a free punch per purchase! Make sure to join us on Friday, February 15th from 5 to 8pm for a special birthday celebration! We would love to thank our community in person for your support of our little shop around the coner. We'll open late for sips and birthday treats and of course shopping! Look for us in the Laytons Village Shopping Center off of Route 108!